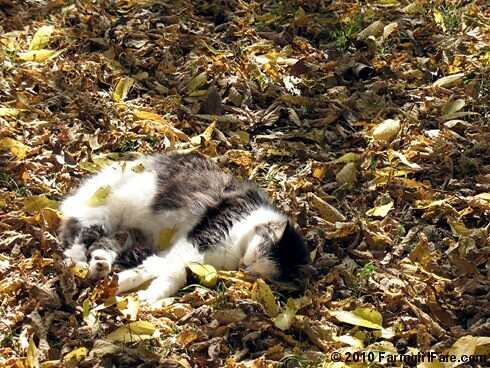 Farmgirl Fare: Wednesday Dose of Cute: Anybody Up for Raking Leaves? 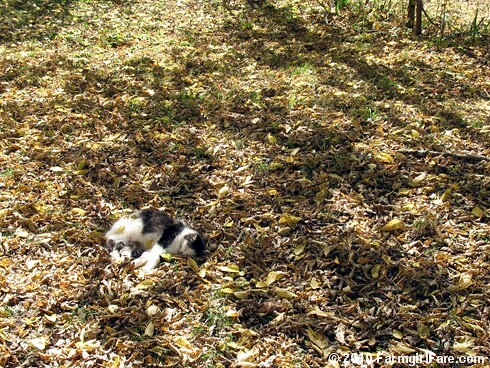 Wednesday Dose of Cute: Anybody Up for Raking Leaves? © 2010 FarmgirlFare.com, the bare branched foodie farm blog where we've never bothered raking up the ten million leaves that fall to the ground each autumn, but last spring, after reading about how great leaf mold is for the garden, I bought myself two giant composting bins meant specifically for leaves. More leaves blew off the trees today than have in the past few weeks combined (I love these blustery days! ), but so far the bins are still empty. I just couldn't bear to bother Smudge. And I doubt he would have helped with the raking anyway. How cute is he !!! I love your blog, I found it on Blog Catalog. Oh how I love to stop by here for a glimpse of cute farm-life. And sometimes I just stare in awe. You sure have a LOT of hay stacked in that barn. Sometimes I wish I lived at a farm - and sometimes I'm just glad my back and arms are not hurting from haystacking. I hope you get a break this weekend - though I guess your days are not really devided into working weekdays and weekends off like mine. We have plenty of our own leaves to rake (sigh! ), but no kitty nearly as cute as Smudge! (I wouldn't want to bother him either.) My dog loves to run and play in leaves, but not much help otherwise! Loved the post about the 'green-apple scented' ball for the donkeys. Those donkeys are just too funny! Ahhh the life of a cat! We have one named Smudge too! Started with Splash, then got Baby Splash, Smudge, Splotch. I guess the next one will be Smear or something like that. Here in south Texas, we don't get the piles of leaves like that. We are just now getting some color. I grew up in Ohio and miss the change of seasons and the piles of leaves. I had to have my cat Cricket put down today (I've had her for 13 years). These pictures reminded me of how much she's enjoyed the fall leaves these past few weeks. She was always an indoor cat but when her back legs got so bad she couldn't run anymore, I took her outside with me one day and she loved it so much she spent much of her last days begging to go back out. I'd let her walk around for a few minutes at the time, and she'd walk around the yard sniffing leaves and occasionally laying down randomly in whatever leaf pile looked best. Unfortunately, she was a two-time cancer survivor and had small tumors all over her body, causing organ failure that was making her rapidly go downhill. It is going to take a long time for me to adjust, but seeing Smudge so happy in his leaves makes me smile. Smudge is so cute and peaceful. I love looking at these photos. It brings me back to my younger years when I lived on a farm. Susan, can you tell us more about the leaf composting bins? I have crazy amounts of leaves each fall, and would love to put them to use, instead of blowing them to the edge of my front lawn for leaf collection. Yes, please: more on the leaf composting bins. I have a compost bin, but it does not accomodate the season's full contribution of leaves. I'd love to get at least one more pile going. Susan, do tell more please! Ha - I love the name Splotch! My apologies for not getting back to you sooner. The leaf compost bins I bought are basically just larger versions of the bins I've been using for years - made from tough black plastic with aeration holes all through it that folds around into a circle about three feet high. That's on the large side for regular composting bins, partly because that much material is hard to manage (turning, etc. ), but as you know, leaves take up so much space, that you really need a bigger bin. You can probably make a simple leaf compost bin from wire mesh. Just form it into a circle and fill it with leaves. It won't absorb heat as well as the black, but it should eventually work. Thank you for the reference, Susan! I checked out Gardner's supply and saw some green wire bins http://www.gardeners.com/Wire-Bin-Composter/20706,34-646RS,default,cp.html that look like they could do the job for me. The reviews mentioned that the green wire sort of melts into the background, so they will actually work a bit better in my suburban landscape. They probably won't compost as fast, but hey, I've got time.